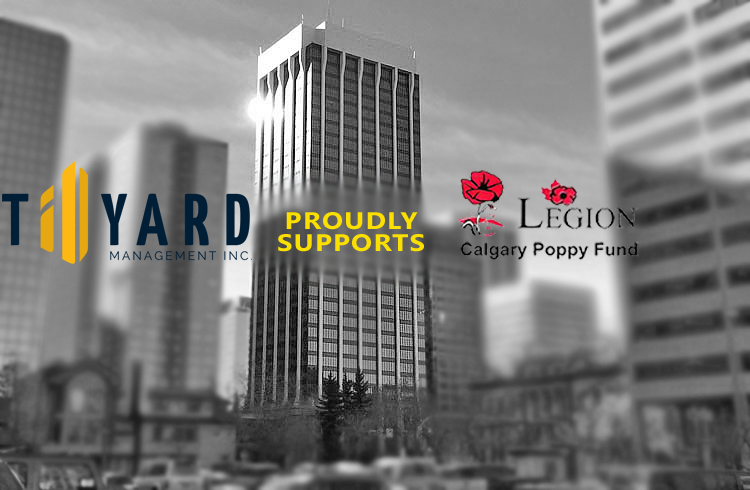 Tillyard Management Inc.’s Calgary office is proudly supporting the Calgary Poppy Fund, which is a service branch of the Royal Canadian Legion, and the Veteran’s Food Bank. The food bank is a Poppy Fund project. This Christmas season, we should be aware that there are many people struggling to make ends meet. While there are unfortunately fewer corporate donations to the Veteran’s Food Drive this year due to the economic downturn affecting many companies, individuals and many corporations are still doing their best to help make up the difference. Together, we can help surviving veterans from distant conflicts, such as World War II, as well as more recent peacekeepers from Kosovo, Afghanistan, Syria, and elsewhere. Sadly, many of these veterans live below the poverty line. The Calgary Poppy Fund is doing important work. Their mandate is that no veteran, veteran’s spouse, widow, or their dependents be deprived of the necessities of life. They are instrumental in providing food, shelter, fuel, dental care and prescription medicine to any veteran family that might be struggling. The Food Bank sends out more than 1,000 hampers of food every year to veterans and their families who live in the Calgary area. So far, we have raised 410.8 lbs of food as well as $900 in cash donations. Please join us to try and make a difference for the families of Canada’s veterans. Food and toiletries are welcome donations. The food drive will be running until December 31. You can find food donation boxes in the main level lobby as well as the 15 lobby. Cash donations will be used to purchase Calgary Co-Op grocery gift cards that will be included in the hampers. Cheques can be made out to the Calgary Poppy Fund and can be dropped off in the Tillyard Management Office, Suite 310. Tillyard Calgary is also proudly supporting Make-A-Wish Canada and Brown Bagging for Calgary’s Kids. It is our hope that everyone has a happy holiday. Merry Christmas and Happy Holidays from everyone at Tillyard.